We are an Energetic and Lively Kildare Wedding Band playing at all the top Kildare Hotels such as The K-Club , Kilashee House . We are available for bookings in Kildare Town, Kildare County and on a nationwide basis. We have over 20 years of professional experience as a Wedding Band and have worked hard to create and maintain an excellent reputation in a highly competitive industry. We provide a wide range of music, for every occasion. We have performed on a regular basis in many of the top Hotels and Wedding Venues throughout Kildare and the surrounding counties. Our music is styled to accommodate all tastes and age groups. 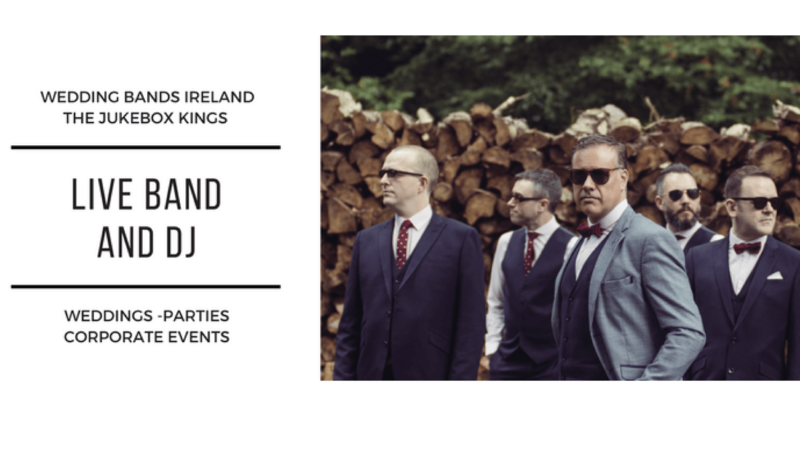 The Ability to adapt and change musical styles to suit the audience and occasion is just one of the attributes you can expect from The Jukebox Kings Wedding Band Ireland. We can also provide full Wedding Entertainment Services such as Ceremony Music, Arrivals entertainment, DJ and Late night Bar entertainment. A Popular option in recent years is also to provide some entertainment on the Day after the Wedding for guests at a BBQ or Garden Party. All types and styles of entertainment can be catered for your Celebration. If you would like to contact us about your wedding requirements or to receive a quote, please feel free to contact us directly via email or by phone. Wedding Band Kildare We are an Energetic and Lively Wedding Band playing at all the top Kildare Hotels, available for bookings in Kildare Town, Kildare County and on a nationwide basis. We have over 20 years of professional experience as a Wedding Band.